Congress President Sonia Gandhi today chose the platform of the Confederation of Indian Industry to make an implicit political statement that the party was preparing to bounce back to power. 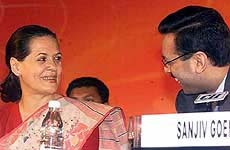 Congress President Sonia Gandhi and CII president Sanjiv Goenka share a lighter moment during the CII National Conference and Annual Session in New Delhi on Friday. A study team of the Council for International Affairs and Human Rights, which recently toured Gujarat, has concluded that burning alive of 58 pilgrims on February 27 at Godhra was an "act of international terrorism planned and executed in connivance with jehadi forces based there." The Kolkata police today charge-sheeted Dubai-based don Aftab Ansari and 14 others in connection with the terrorist attack on the American Center here on January 22. In moving Air Marshal V.K. (Jimmy) Bhatia, the former AOC-in-C of the Western Air Command (WAC) to the Air Headquarters as Inspector General (Flight Safety), Chief of the Air Staff, Air Chief Marshal S. Krishnaswamy has sent out a message loud and clear to all in the IAF— "rules are the same for all and indiscipline will not be tolerated." 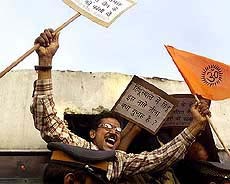 A VHP activist shouts slogans as he courts arrest during a demonstration in Mumbai on Friday. The activists protested against the killing of a senior Bajrang Dal activist in Bhiwandi, 60 km north of Mumbai, on Wednesday night, and demanded that the culprits be brought to book. A devotee carries a ceremonial harness that pierces his body with metal skewers during a South Indian festival of Sri Mariamman in Mumbai on Thursday. The BJP Parliamentary Board is likely to meet on Sunday to put the final stamp on the formation of a BSP leader Mayawati-led coalition government in Uttar Pradesh. Much to the discomfiture of visiting Sri Lankan President Chandrika Kumaratunga, the Atal Behari Vajpayee government did not raise the issue of the extradition of LTTE chief V Prabhakaran. "Brucellosis," a disease affecting cattle, is now spreading to humans in Jodhpur. Congress President Sonia Gandhi today chose the platform of the Confederation of Indian Industry (CII) to make an implicit political statement that the party was preparing to bounce back to power. And while addressing the captains of the Indian industry for the first time, Ms Gandhi took care to announce her party’s economic agenda as well. The atmospherics and the timing of the CII Annual Session here spurred the Leader of the Opposition to lay down the broad contours of the Congress’s economic agenda and punctuated her speech with observations on the country’s “secular moorings” and “collapse of governance”. Her tone besmirched with regret, she observed that the land of the Father of the Nation was bleeding and that the land of Sardar Patel, “who epitomises decisiveness in administration," was “witnessing a collapse of governance”. This was one of Ms Gandhi’s first addresses to the captains of Indian industry. In a satirical tone, she pointed out that “when the Leader of the Opposition is invited by the country’s leading industrialists to start off their annual get-together, it is natural to speculate what could be the motive, what sort of political winds are blowing and in what direction”. Fresh from a successful Congress Chief Ministers’ conclave in Guwahati recently, she said her party’s approach to governance “stems from the recognition of a most basic reality to our society — that we are the land of the greatest diversities”. And as though smelling power already, Ms Gandhi announced her economic agenda as well. Strengthening the foundations of agriculture, the creation of new employment opportunities, reviving investment momentum, strengthening public sector enterprises in strategic areas, and the launch of the massive food-for-work programme were some of the points she listed. Even as she said that her party’s approach to economic issues was not wedded to any doctrine, she did emphasise the inherent merits of a mixed economy system and the Congress’ interpretation of the development paradigm. “A mixed economy is an economy where enterprise is freed from controls but where the government has not lost control. 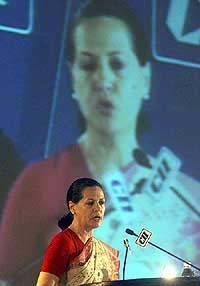 It is balance that the Congress governments are seeking to achieve”, she said. In a visit replete with symbolism, Congress President Sonia Gandhi will go to violence-torn Gujarat on May 1 to lead a women’s peace march in Ahmedabad. May 1 happens to be Gujarat Day. Ms Gandhi will first go to Porbandar, the birthplace of Mahatma Gandhi, and address a rally there. She will also pay obeisance at a local temple. Chief Minister Narendra Modi. “It is a march on a higher plane to see that humanity comes round,” said a senior Congress leader. A study team of the Council for International Affairs and Human Rights (CIAHR), which recently toured Gujarat, has concluded that burning alive of 58 pilgrims on February 27 at Godhra was an "act of international terrorism planned and executed in connivance with jehadi forces based there" and has given clean chit to the Narendra Modi government on the controversy over the late deployment of the Army in the affected areas of the state. The team led by a former Chief Justice of Calcutta High Court Justice D.S. Tewatia points out that one of the objectives behind the Godhra carnage was to weaken Indian positions on the border and to make the area more porous for jehadi infiltrators and smugglers of drugs and arms by forcing India to divert its Army from border for civil deployment. The CIAHR is headed by Union Minister for Consumer Affairs and Public Distribution, Shanta Kumar, who was admonished by the BJP for demanding Modi’s removal. The report also dismisses the news reports and the allegations levelled by political parties that the delay in the deployment of the Army led to widespread communal violence. The study team, comprising Dr J.C. Batra, senior Supreme Court advocate, Dr Krishan Singh, academician from Chandigarh, Mr Jawahar Lal Kaul, and Prof B.K. Kuthiala, Dean Faculty of Media Studies, G.J. University, Hisar, also blamed the local administration and the police of Godhra for its slow response and reluctance to use force to control the rioting mob that torched the Sabarmati Express. The team has recommended setting up of three working groups: diagnostic team, curative team and pre-emptive action team to go into the genesis of the problems and suggest remedial measures to manage the communal divide between Hindus and Muslims without further loss of life and property. The BJP today deplored the ‘baseless tirade’ of ‘foreign missions’ on the Gujarat violence. These missions should realise that the violence was not a one-sided affair, BJP Parliamentary Party Spokesman Vijay Kumar Malhotra told reporters. He said the ‘wrong projection’ of the Gujarat violence as ‘genocide’ by some TV channels and newspapers had also misled the foreign powers. Terming Gujarat violence as ‘genocide’ was totally unacceptable and these countries should not forget that there were also 200 persons from the majority community among the 600 victims of the communal flare-up, he said. ALLAHABAD: Any kind of interference or comments from other countries on Gujarat would not be tolerated as it was purely an internal matter, AICC National Secretary Anil Shastri said here on Friday. Talking to newspersons here, Mr Shastri said, "no foreign country or agency had the right to interfere in our internal matters." "If non-governmental organisations visited Gujarat and gave their reports we would welcome but any comment by foreign countries on the situation would be treated as interference," he added. Dispelling doubts about its concern towards students, the Gujarat Government today came out unscathed in the Supreme Court and informed it that a repeat examination would be held in Ahmedabad and Baroda for all students who missed the April test. The state government even pre-empted the Bench comprising Mr Justice B.N. 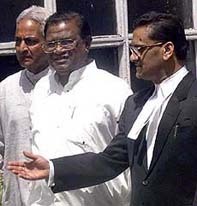 Kirpal, Mr Justice Arijit Pasayat and Mr Justice H.K. Sema by saying that even those students who had taken the examination would be allowed to appear in the repeat test provided they gave an undertaking that marks scored by them in the April test should not be taken into account. Mr Salve said the attendance of the children for classes X, XI and XII were normal as it touched around 98 per cent as against an average of between 96 and 97 per cent in the previous years. In a statement, the Communist Party of India (Marxist) Politburo said the Vajpayee government was making itself a subject of ridicule by its repeated objections to expressions of concern by foreign countries about the happenings in Gujarat. Deputy Commissioner of Police Soumen Mitra said the accused had been charge-sheeted with in 90 days of the first arrest in the case on the basis of incriminating documents recovered during investigation. Mr Mitra said the 15 charge sheeted, six of whom were absconding, were engaged in various disruptive activities in support of certain jehadi organisations and were trying to establish hideouts. He said after the death of Asif Reza Khan in an encounter with the Gujarat police, the terrorists had tried to break the morale of the police by launching a strike on the American Center. Among others against whom charge sheets were filed were Jamiluddin Nasir, Adil Hasan, Roshan Alam, Shakil Mallik, Dilip Kumar Kantilal, Musharaf Hasan, Hasrat Alam and Shakil Akhtar. In moving Air Marshal V.K. (Jimmy) Bhatia, the former AOC-in-C of the Western Air Command (WAC) to the Air Headquarters as Inspector General (Flight Safety), Chief of the Air Staff, Air Chief Marshal S. Krishnaswamy has sent out a message loud and clear to all in the IAF—"rules are the same for all and indiscipline will not be tolerated." The Chief of Air Staff, in issuing the orders for the transfer of Air Marshal Bhatia, who is known to be among the best in the force and a brilliant strategist, has also implied that the IAF is a professional force and made it clear that the seniors have to not only become role models but also set examples by their actions for the juniors to follow. In a late evening decision on Wednesday Air Chief Marshal Krishnaswamy, who was himself heading the committee looking into the report presented by Air Marshal M.S. Sekhon (retd) on the incident of the violation of the air space by Air Marshal Bhatia, issued orders for his transfer from the WAC to the Air Headquarters. The decision came as a surprise to many in the IAF as there were indications earlier that after the leaking of the letter written by Air Marshal Sekhon (retd), seeking political help to further his career, Air Marshal Bhatia may not face stern action as the main focus had shifted from him. The other factor leading to such theories was the fact that Air Marshal Sekhon (retd) was heading the inquiry which went into the incident involving Air Marshal Bhatia, before he was asked to resign for seeking political help to further his career. With Air Marshal Sekhon (retd) facing action, the inquiry report prepared by him also came under cloud. This more so as Air Marshal Bhatia also sought a fresh probe into the incident on the plea that the report of Air Marshal Sekhon (retd) could have been biased. But unfortunately for him, Air Marshal Sekhon’s report was based on the details of the black box of the AN-32 transport aircraft which Air Marshal Bhatia was flying when he came under fire from the Pakistani forces after crossing the Line of Control (LoC) in the Kargil region of Jammu and Kashmir in the month of February. While the negotiations for sorting out the finer details for forming the government in Lucknow between the two sides are still continuing, the BJP leaders are hopeful that BSP leaders Mayawati and Kanshiram would agree to part with important portfolios of Finance and Home. Another point of difference between the two sides is the proposed coordination committee which the BJP wants to be headed by former UP Chief Minister Rajnath Singh. The BSP leaders are said to be insisting that the coordination committee would have no say in matters of transfers of police and other officials. An indication of continuing differences between the two sides was available when BJP Parliamentary Party spokesman Vijay Kumar Malhotra evaded a direct reply to a question on the meeting of the Parliamentary Board. Mr Malhotra said,” Till this moment, no meeting has been fixed. However, it can take place at a short notice as all members of the board are in the Capital”. According to a UNI report, the BJP top brass has intensified efforts to install a BSP-BJP government in Uttar Pradesh before the crucial debate in Lok Sabha on the Gujarat motion so as to ensure the BSP’s support during voting on Tuesday. The dubious past of Mayawati, in which she was allegedly involved in multi-crore scams, will not be a hurdle to her becoming Chief Minister of Uttar Pradesh for the third time. The clarification came from none other than the Governor, Mr Vishnu Kant Shastri, himself when he said that a person, who is found fit to be an MLA, is fit to head a government. The Samajwadi Party (SP) had asked the Governor not to invite Mayawati to form government as she is yet to come out clean from the charges of misappropriation of funds in the Float Pump case and Ambedkar Park scam. The state president of SP, Mr Ram Saran Das, had even submitted a memorandum in this regard to the Governor. Mr Das argued that inquiries conducted by different agencies of the state government had found Ms Mayawati guilty in both these scams. The then BJP government, led by Mr Kalyan Singh, had instituted inquiries and on both the counts the BSP leader was found guilty. “This is really a shame that now the BJP is hobnobbing with the same person whom their leaders had called chor (thief),” said Mr Das. Citing the Jayalalitha case, Mr Das said if she (Jaya) could be prevented from becoming the Chief Minister of Tamil Nadu then how could Mayawati become Chief Minister? The Governor, however, told The Tribune that the charges are to be proved in a law of the court. “And to the best of my knowledge no court had found Mayawati guilty on any count”, he said. Ms Mayawati has been accused of indulging in malpractices during her two brief stints as Chief Minister when misappropriation of over Rs 100 crore is alleged to have taken place in the construction of Ambedkar Park in Lucknow. 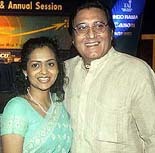 In another inquiry, she was also found guilty in the Rs-40 crore Float Pump scam. The Nationalist Congress Party (NCP) today described as "unholy" the BSP-BJP alliance in Uttar Pradesh and said the Samajwadi Party, having emerged as the single largest group, should have been invited to form the government first. The party also ruled out any merger with the Congress. "The alliance goes against the spirit of norms laid down by the Sarkaria Commission on Centre-State relations that in the event of a single party not getting majority and in the absence of any pre-poll coalition, the single largest party should be invited to form the government", NCP General Secretary P.A. Sangma told newspersons here. Releasing the political resolutions adopted by NCP’s Working Committee, he said allowing the alliance to form the government was against the norms and spirit of parliamentary democracy. He demanded dismissal of the Narendra Modi Government and imposition of President’s Rule. Ms Kumaratunga today preponed her departure by about 36 hours and was to leave shortly before midnight today instead of Sunday morning. Though no reason has officially been given by Sri Lankan for preponing the departure, well-placed sources here said Ms Kumaratunga was peeved about the Vajpayee government’s stand on the peace process in the island nation. Ms Kumaratunga is bitterly opposed to the peace process which is largely perceived to be the brainchild of her political rival, Prime Minister Ranil Wickremasinghe. During her meeting with Prime Minister Atal Behari Vajpayee, sources said he made it clear to Ms Kumaratunga that his government was absolutely in favour of the peace process. Alleging that the Tehelka tapes were ‘tampered’, Laxman said events were not in (proper) sequence in the tapes and had been tampered with. When grilled by Tehelka counsel Siddarth Lutthra, he said he was interested in the Rs 5000 crore investment to be made in India as said by the reporters posing as arms dealers. Admitting that he had made a statement during the conversation with the Tehelka reporters that Principal Secretary to Prime Minister Brajesh Mishra used to liaise between the PMO and the party, Laxman said it was a statement of fact. Claiming that he had asked his Private Secretary Satyamurthi to intimate the party’s accountant about the Rs 1 lakh given by Tehelka for party funds, Laxman said the accountant had collected the money from his office but he had never asked for a party acknowledgement. He also alleged that the reporters were dropping names like Ranjan Bhattacharya, whom he never knew personally, to prompt him to speak about them. Former Additional Defence Secretary L.M. Mehta also denied he had accepted bribe from the Tehelka reporters and said the tapes by the news portal on the expose on corruption in defence deals had been doctored. 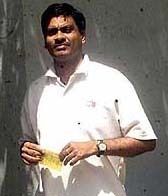 A Haryana cadre IAS officer, Mehta contended that the tape showing him “picking up a packet allegedly containing a gold chain” should not be seen as if he had accepted the bribe. He dismissed the Tehelka counsel’s claim that he had demanded Rs 2 lakh as bribe from the so-called agents of fictitious arms company. West Bengal Minister of State for Transport Narayan Biswas today surrendered before a court in Dakshin Dinajpur district in connection with an attempted murder case but Chief Minister Buddhadeb Bhattacharya ruled out his removal from the Left Front government. The Centre today extended the ceasefire with the NSCN (K) by one year, effective from April 28. Announcing this in the Lok Sabha today, Home Minister L.K. Advani said the government had entered into an accord for a formal ceasefire with the NSCN (K) for one year from April 28, 2001. He said there had been discussion between representatives of the government and the NSCN (K), and both sides were satisfied with the progress. Both sides had, therefore, agreed to extend the ceasefire by a period of one year beginning from April 28 this year, he added. The BJP today expelled four party MLAs and two associate members from the party on charges of anti-party activities. were Gourhari Naik, Bhanu Charan Naik, Laxman Soren and Surendra Kuanr. The two dissociated MLAs were Padma Charan Haibru and Purusottam Naik.